World Fairs offer something for collectors of all kinds. Take a virtual tour of the 1904 World's Fair. This is a collection of images used in the 1904 edition of Cosmopolitan Magazine. This engaging feature-length documentary looks at an important time in American history through a series of compelling, intimate and entertaining stories. The movie features hundreds of never before seen images, the first High Definition transfer of rare motion pictures of the Fair, and interviews with nationally recognized historians, authors and World's Fair experts. 1904 Era Display Advertising - Some fun ads from the time of the Fair. 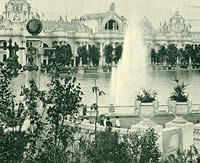 1904 St. Louis World's Fair - The 1904 World's fair was by all accounts the most beautiful, educational and exciting of all the international expositions ever presented. Spend a few minutes reading about this fascinating event in U.S. history. 1893 World's Columbian Exposition - Relive the glory of Chicago's finest hour. This record setting Fair is makes for fascinating collecting as well. Its incredible architecture and layout became a pattern for the many expositions to come. Books on World Fairs - There are all kinds of great books on World Fairs. World's Fair Collecting Links - World's Fair info from all over the web. World's Fair Trivia - Enjoy some interesting Fairfacts from the 1904 Fair. wonderful vintage World Fair posters.